Police arrested a total of 29 people. We are participating in this action in response to a national call for non-Black people to turn up for two central reasons. As non-Black people acting in solidarity, it is necessary to disrupt a capitalist structure that has been built on the physical and economic exploitation of Black bodies since our country’s inception. We also recognize our unique position in the struggle for economic, political, gender and racial liberation: though many of us do identify as people of color, we are able to participate in such an action with significantly lower risk of physical harm and brutalization by the State specifically because we are NOT identified as Black. We maintain that the U.S. is and has always been a state founded on the exploitation, enslavement and oppression of people of color worldwide. The political and economic system we struggle under today would not exist without the centuries of exploitation of Black and brown people. It is crucial to recognize that capitalism is a system that is upheld by white supremacy. We cannot end capitalism without ending white supremacy. There is no such thing as total liberation without ending the exploitation of Black and brown bodies. Mayor Marty Walsh and Governor Deval Patrick have both condemned the current anti-racist movement and its participants as “disruptive” to the city of Boston. But Boston is a city that stops, on average, 152 Black and brown people a day on their ways to work, to their homes, to school and to their families. Is that not “disruptive”? Boston is the third most policed city per capita in the country. Is it not disruptive for Black and brown residents to live under this extensive surveillance, under police intimidation and brutality? How can elected leaders of our city and state support the violent disruption of Black lives, but not the people resisting that very violence? A delay in traffic or on the MBTA is not comparable to the constant state of fear and anxiety created by police in Black and brown communities. Governor Patrick has also complained that the peaceful protests are “expensive,” citing $2 million in police overtime pay during the last three major protests. Unnecessary deployment of both state and local forces, outfitted in full riot gear and with military-grade weaponry on reserve, is bound to be “expensive.” The $120 million used by our state government annually to incarcerate drug offenders is “expensive,” as is the proposed $2 billion budget to construct new detention facilities in Massachusetts in the next 7 years. Clearly, the State incurs immense expense criminalizing and surveilling Black and brown bodies. But who pays the highest price? Black and brown individuals and families who must try to rebuild, post-incarceration, in a city with no living-wage legislation, rapid gentrification and one of the highest costs of living in the country. 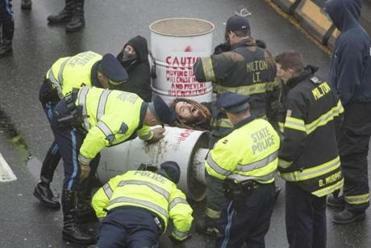 Traffic was blocked on Interstate 93 north and south of Boston this morning by protesters who attached themselves to 1,200-pound barrels. 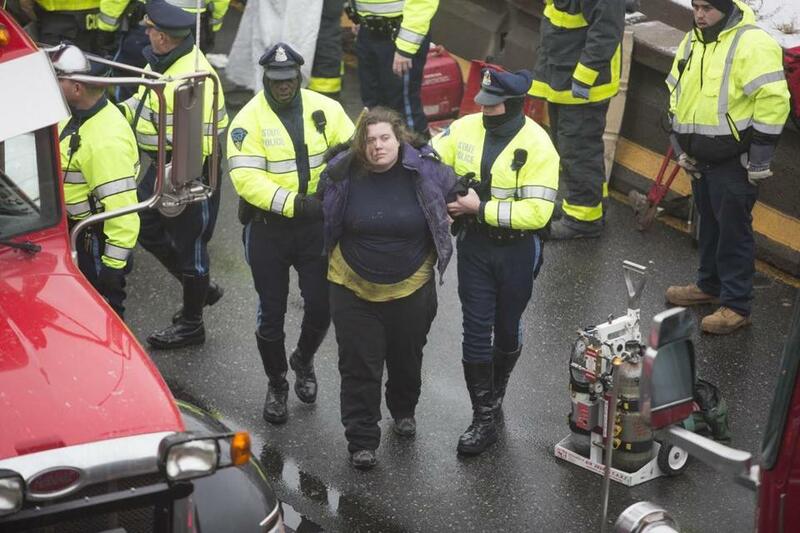 Somerville/Milton/Boston Massachusetts — Activists have shut down Interstate 93 Southbound and Northbound during morning rush hour commute into Boston to “disrupt business as usual” and protest police and state violence against Black people. “As a white person, my only options are to act against white supremacy or to be complicit in it. I’m here today because I refuse to be complicit” said Emily O. “As a white man, I know I benefit and am protected by a racist society. I am participating today because it is necessary for those who are the least vulnerable to step up and put our bodies on the line if we ever want to build a just world,” said Eli C.
”As a white feminist, I take part in this action because anyone who claims commitment to equality must take action to dismantle intersectional oppression. Idling is a privilege afforded only to those who genuinely do not care,” said Nelli. Protests hinder traffic in D.C.